Sustainable soap - 100% tallow! We don't use much soap, so I haven't been able to experiment much lately. My last batch was a disaster that had to be rescued by a hot-process rebatching, so we have had a massive excess of soap to use up from what turned into a triple-batch. When we had our last steer killed we asked the butcher for all the kidney fat, so we were both keen to try making some more soap using the tallow (how to render the fat). Pete helped me to make a batch of bath soap using tallow, coconut oil and olive oil, so get my confidence back after the last disaster (caused by not measuring properly). When we saw that batch was a success, we decided to finally try 100% tallow. our 100% beef tallow soap! The reason that we hadn't tried 100% tallow before was the higher temperatures required to keep the tallow liquid during the mixing for cold-process soap. I was nervous about it and wanted to practice using coconut oil and olive oil mixtures first, at lower temperatures. I modified the bath soap recipe that I published earlier to use 100% beef tallow. I melted the tallow, while Pete prepared the caustic. When both mixtures were at 55 degC we added the caustic solution to the melted tallow and essential oil, and mixed using a stick blender until the mixture reached "trace". Then we poured the mixture into one of Pete's stainless steel moulds. When we saw the mixture starting to enter gel phase we both panicked that it was going to get too hot and volcano out of the mould.... so we put the mould in the bath, in luke warm water and positioned a pedestal fan over the soap mould..... maybe an over-reaction! While gel-phase had been very breifly mentioned in the soap book I read originally, it didn't really explain the details, it was explained better here. Now I can see that the centre of our soap "gelled", but as we cooled the edges, it was a "partial gel phase". Would it have volcanoed if we didn't cool the soap mould? We will never know. But next time I would like to mix the soap at a lower temperature, as suggested by this blog. And we might let it go through gel-phase, just to see what happens. Have you tried to make soap from tallow or lard? What temperature do you use and have you ever ended up with a volcano!?! 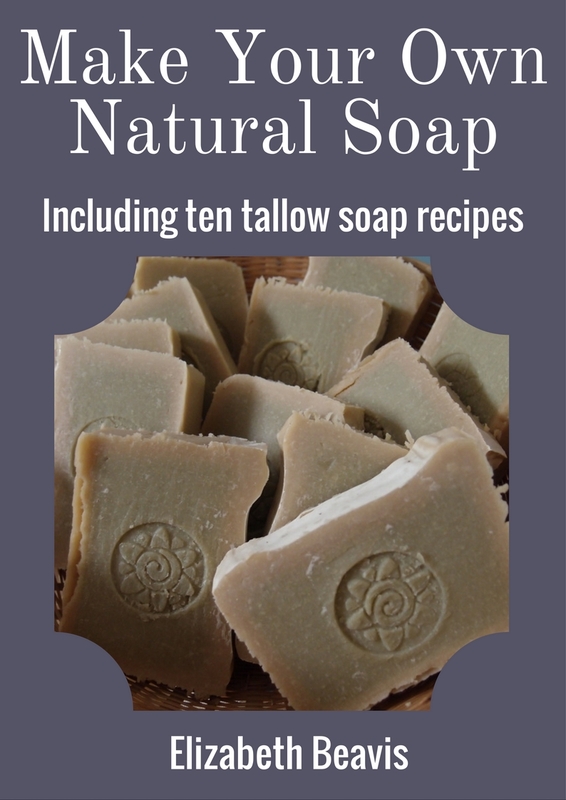 You can get all my tallow soap recipes in my eBook Make Your Own Natural Soap, more information here. Would you like to try making your own soap from natural ingredients, but don’t know where to start? This eBook will take you through everything you need to know to make simple soaps from natural ingredients, including herbs, clays, charcoal, oatmeal and coffee grounds. It also explains how to use tallow in soap. 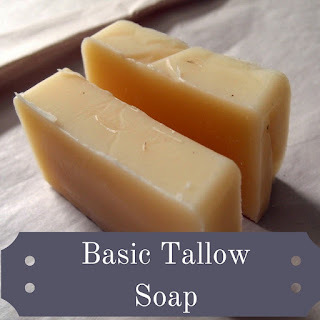 Tallow is cheap and locally available, and it makes long-lasting moisturising soaps, it is an under-utilised ingredient in home soapmaking in my opinion. 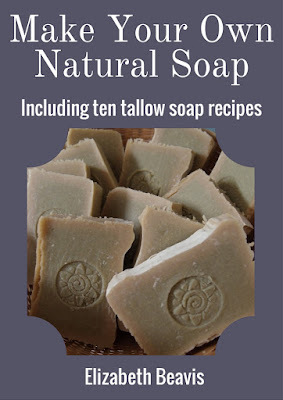 This eBook includes 10 recipes specifically designed for tallow soap. Why use natural soaps and salves? I've only made two batches of soap and I think I've still got about 12 months supply left. It's to ugly to give as gifts, but I love using it. I'd like to experiment more, but I guess I need to wash more often and get through my stash ;) I didn't know you could make lye! I have made 100% tallow soap. I mixed the lye and fats at 38 degrees C and stirred with a spoon until the temperature dropped to 35 degrees before using the stick blender. I have never had a problem with it volcano though. Are you going to make traditional lye? With hard wood ash and rain water? I would love to do that here too, just haven't got around to it yet. I believe it is hard to get the right level of caustic in the lye mix and you often end up with soft soap (like hand washing liquid). How to take Box cuttings.